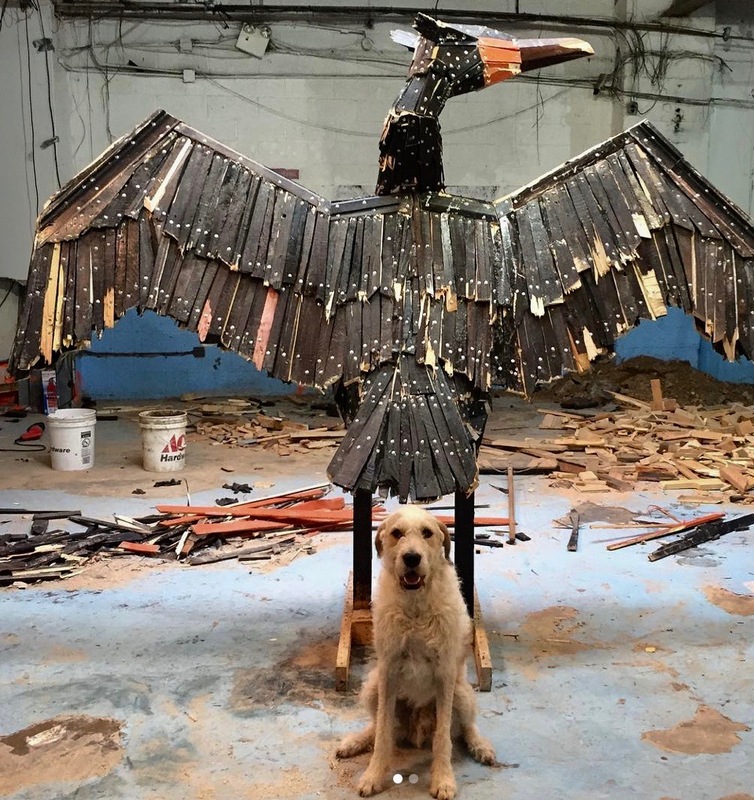 Nicholas Holiber: Birds on Broadway, Audubon Sculpture Project consists of 12 sculptures of birds that the National Audubon Society determined to be particularly threatened by climate change. 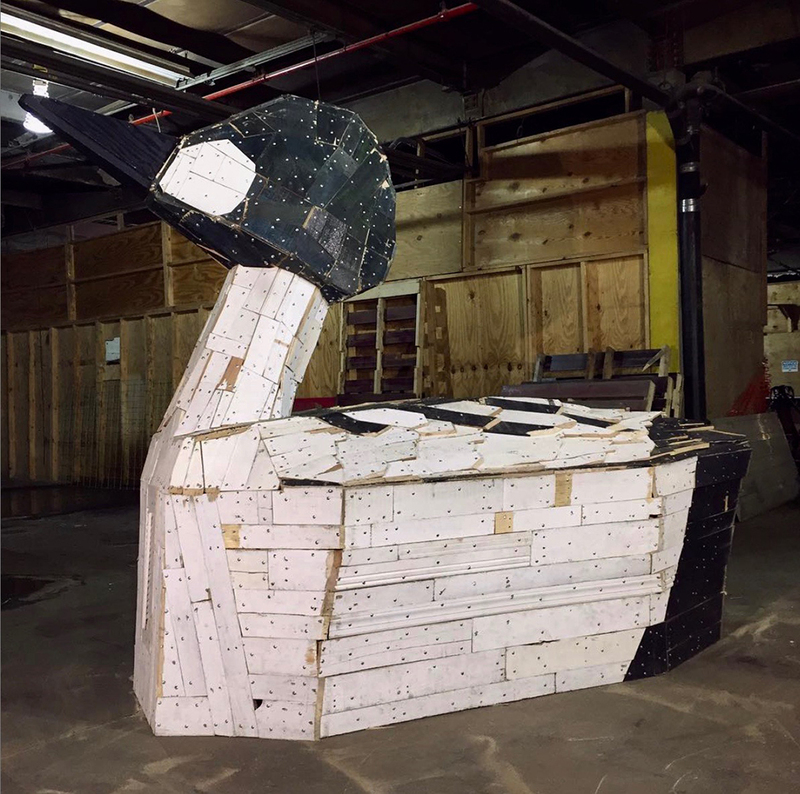 Each sculpture will be made out of 100% reclaimed or recycled wood, through a partnership with Big Reuse. 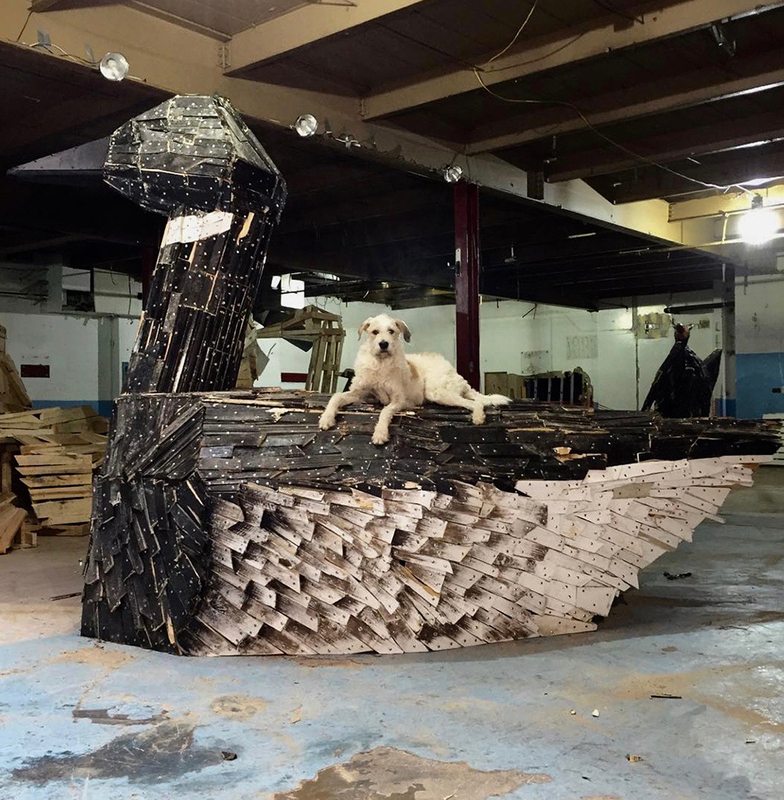 Holiber will also reprocess found wood from around the streets of New York City. 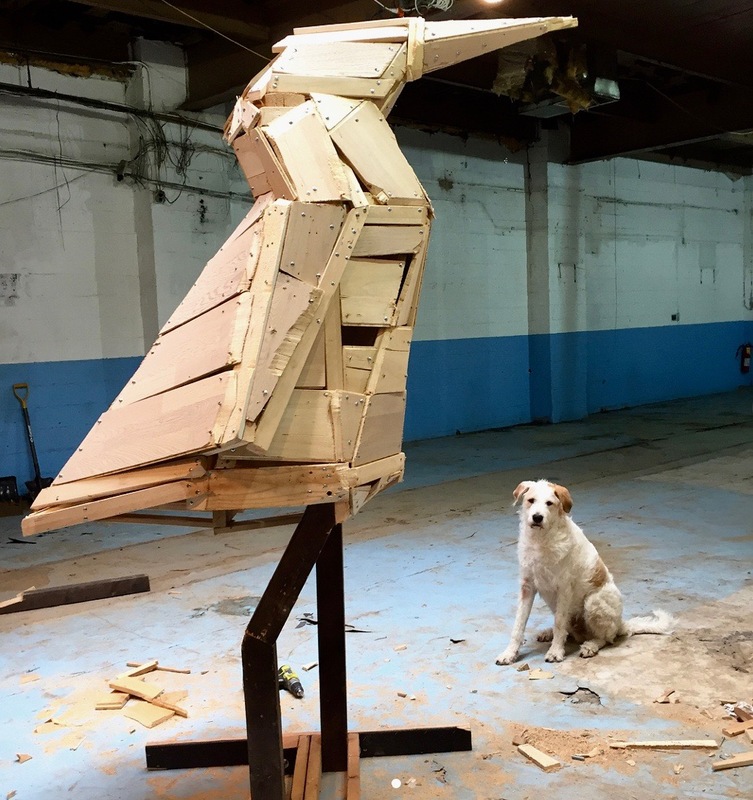 From the 145 threatened species that live in, or migrate through the city, The Audubon Sculpture Project has chosen a dozen species that include ~ American Bittern installed on 79th Street, Hairy Woodpecker on 120th Street, Western Tanager at 86th Street, Double-crested Cormorant at 103rd Street, Common Goldeney at 117th Street, Hooded Merganser at 136th Street in Montefiore Park, Wood Duck at 157th Street at Audubon Terrace, Brant Goose at 96th Street, Snowy Owl at 148th Street, Rednecked Grebe with chicks at 64th Street in Dante Park, Peregrine Falcon with Prey at 72nd Street, and Merlin with Prey at 166th Street in Mitchel Square Park. 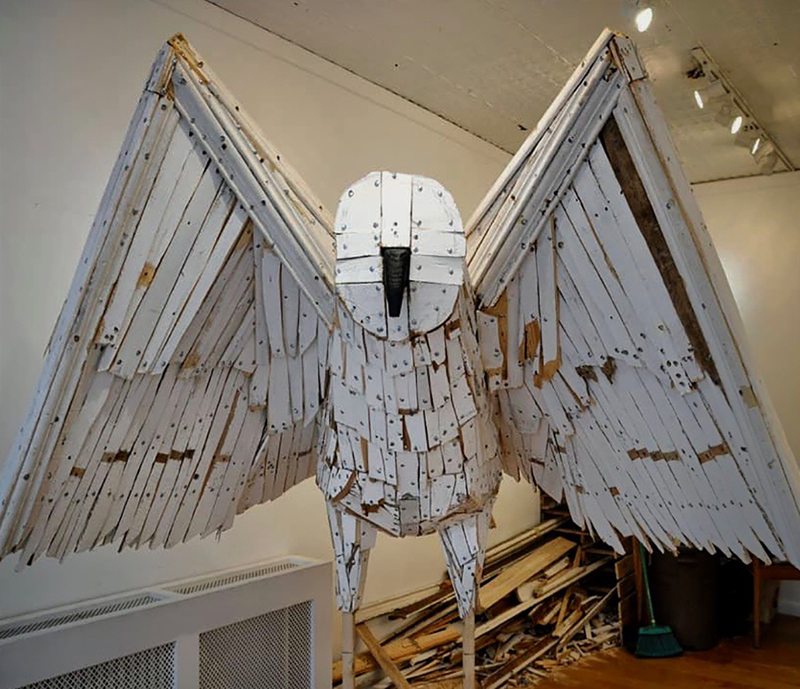 This Project recognizes that Audubon’s 2014 Bird & Climate Change Report warned that half of all North American bird species will be jeopardized over the coming decades due to “shifting and shrinking habitat zones as a result of global warming.” Each of the birds being featured are native to New York City, or pass through the five boroughs on their migration routes. Nicholas Holiber lives and works in Brooklyn. You might remember the Brooklyn-based artist from his March 2016 solo exhibit at Gitler & __ and his large-scale installation, Head of Goliath in Tribeca Park. Holiber is the youngest artist ever to have a solo exhibition on the Malls, and this will be one of the largest to date. More info and images here. The American Bittern ready for feathers, and Vito installed on Broadway at 79th Street. Thanks to Vito (the dog) for giving us some scale. 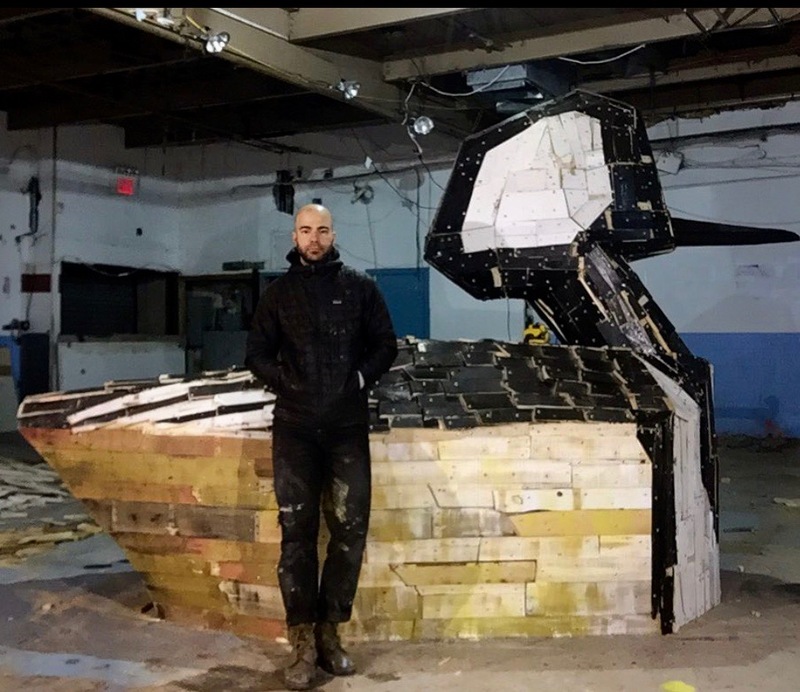 Nicholas Holiber: Birds on Broadway, Audubon Sculpture Project, will be on view from April, 2019 through December, 2019. Head North to Hamilton Heights and revisit the Audubon Mural Project and the Jacob Schiff Park Audubon Mural Project. Next Next post: Get Ready For ~ Harlem EatUp! 2019 ~ Now in its 5th Year!